advanced release price of $1,250 each (unframed) plus shipping. Mitchell-Innes & Nash and Art Resources Transfer are delighted to announce a new fundraising edition by Leigh Ledare, following the recent publication of Double Bind, featuring the artist in conversation with Rhea Anastas. All proceeds from the sale of this work will directly support A.R.T.’s innovative publishing (A.R.T. Press) and the free distribution of contemporary art books to public schools and libraries (D.U.C. ), enabling us to continue to make art accessible to the broadest possible public. This fundraising edition is a singular opportunity to acquire a work relating to Ledare’s Double Bind. Ledare’s complex and critically acclaimed project maps structures of social convention and photographic representation onto the triangular relation between himself, his ex-wife Meaghan Ledare-Feddery, and her current husband Adam Fedderly. 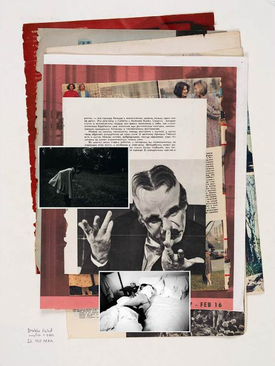 Editions contain each of the three major components of the installation, including two portraits of Ledare-Fedderly by Ledare and Fedderly respectively, and a selection of ephemera culled from Double Bind’s collection of print media. Each edition features the two portraits superimposed over photographs of ephemera in 15 different compositions, thus making each print in the edition unique. It will be published in an edition of 12 + 3 APs, measure approximately 16 x 20 inches overall, and retail for an advanced release price of $1,250 each (plus framing). To see the complete edition, pleaes click here.